I am trying (and failing) to temper my glee about some upcoming work travel. You see, I used to travel for work ALL THE TIME. And not just travel: international travel. Executive Mileage Plus Platinum membership travel. It was grueling and sometimes lonely and involved a lot of late-night hotel VH1 marathons and room service. At the time I couldn't wait to get home. Ah, the old days. Since having the kidlets I am lucky to see the inside of an airplane twice in a year, and usually this is the happy consequence of someone I love tying the knot. Don't get me wrong: we travel as a family all the time (roadtrippin' is our game!) but it's almost always the four of us and inevitably involves me throwing snacks into the backseat of the car on the highway. SO. This four-day work trip on the horizon represents the second time in six years that I have boarded a plane and gone somewhere alone, with only some magazines, my ambition, and a suitcase full of fabulous clothes to keep me company. I'm a teeny bit stoked. There are daytime meetings and nighttime engagements, so needless to say, I need to shop. For day, a few items that say "I'm creative but still reliable! 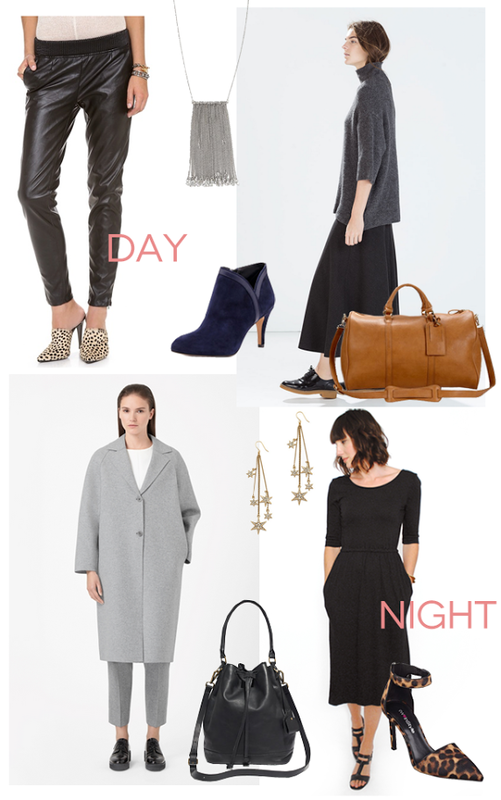 ": a packable dress (that begs for a necklace), a pair of slightly edgy pants, a simple funnel-neck sweater, heels that mean it (but can still handle an airport), and a roomy bag for computer and whatnot. For night, a dress and some utterly impractical shoes, thank you very much, with earrings that might otherwise get pulled off by tiny reaching hands. Now hand me that weekender. It's time to get packing.